When my husband died, my mouth wasn’t big enough for the scream. Life can be a real rollercoaster ride. Seriously. I typically love rollercoasters, but not this one. My beloved husband of fifteen years passed away from airway obstruction. The saddest part was that his death was unnecessary; we live in a trailer park, due to finances. The EMT”s decided that because we live in a trailer park, that he was a drug addict and treated choking as an OD, which killed him. The lesson here is that assumptions can kill. Yes, they sure can. The war on drugs has turned us into a society that lacks empathy. The bias these EMT’s had proved to be deadly, and according to the autopsy, incorrect. 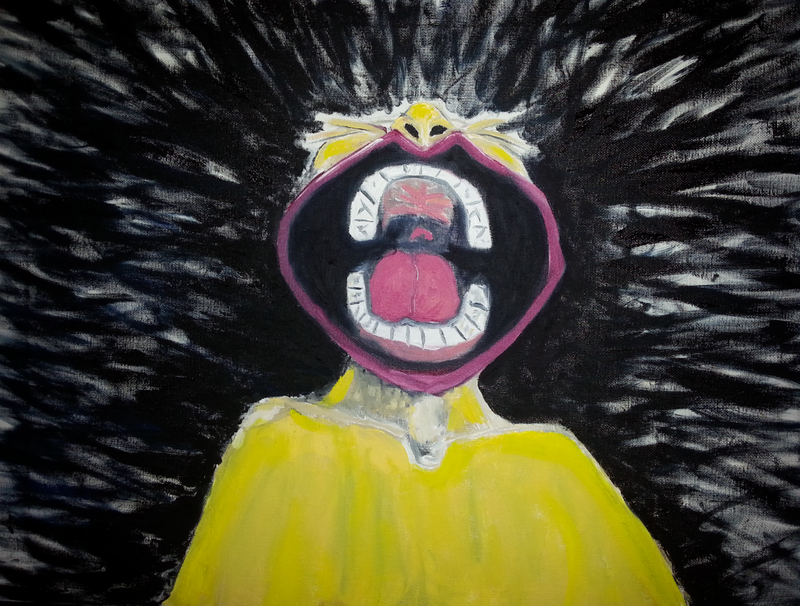 He had no drugs in his system other than his prescribed bipolar meds. So, as in all things, art is the medium of my expression. I can’t do this any other way. 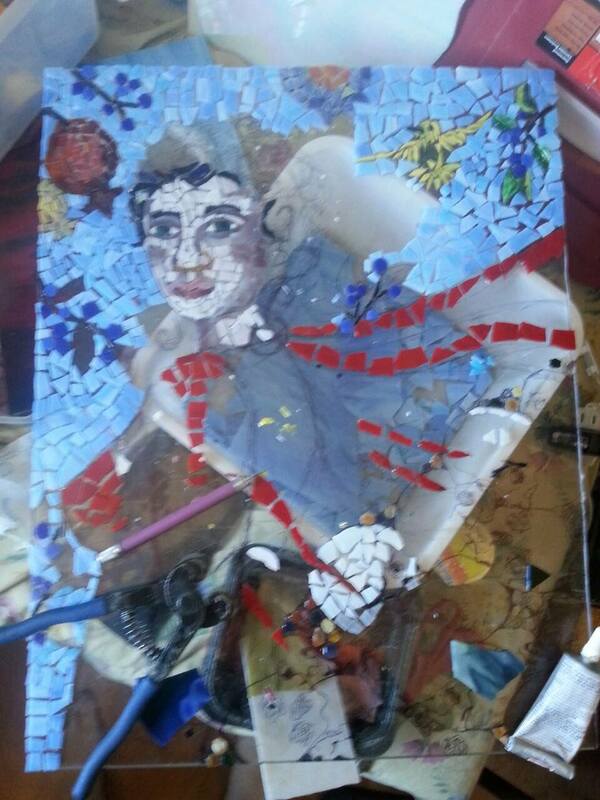 Justine is coming along nicely; the last of her little flowers were put in place today. Maybe. I reserve the right to add to them, if it looks like they need them, come morning. Now it’s the leaves to do. Those are also going to be a project, in and of themselves. Lots of leaves, in different shades of green, all over her. 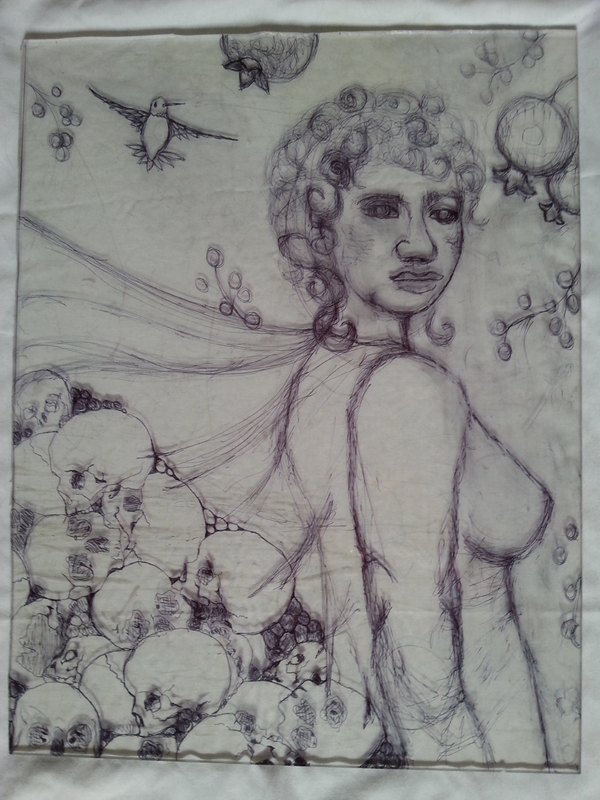 The front is doing fine; the map is almost done, the sea is left as well as her hair and hands. Those hands have been the very devil to cast! Who knew?! More pics to follow, as she progresses. GearCon is here again, and I got an invitation! I had fun at the last GearCon exhibition, so this one ought to be a good time, too. the civilizations that we humans have come up with. There’s a lot of bodies that are buried, no matter where one looks. In this case, I’ve used a Western woman, one that is French, to symbolize the West. We see this symbol in the statue of Liberty, in the famous painting of Liberty overrunning the walls, in Revolutionary France. The French were the worst of the lot, when it came to slavery. The estimates are that they enslaved approximately 1.5 million people. The United States came nowhere near those numbers, in the total of people enslaved. 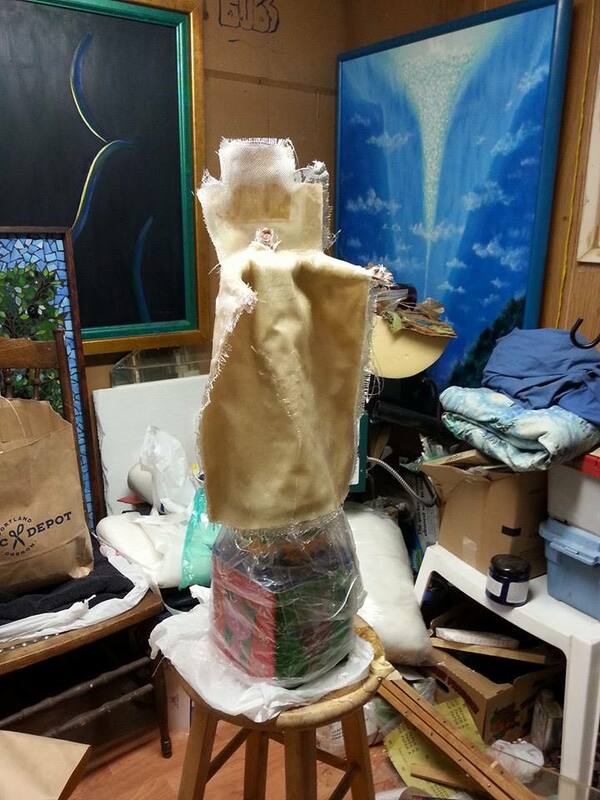 Now the piece is sitting, curing. In about two days, after the cure, she gets her grout. I’m using a charcoal colored grout; I could have used a white, but that is not the blood and bone that has created the foundations of our society. Nope. Black bodies, Chinese bodies, Native bodies (lots of Native bodies), all watered the roots of American prosperity, often without getting to share in that prosperity. This piece is about that, as well as the secrets and lies in my own family, and the many other families that are out there, with ancestors they can’t find. Today has been a pretty productive day! 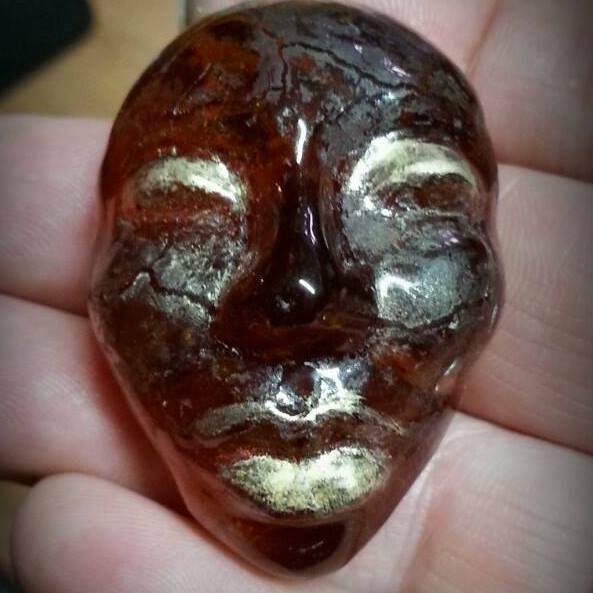 this is Justine’s face, with mica pigments fused in the kiln on her lips and eye lids. 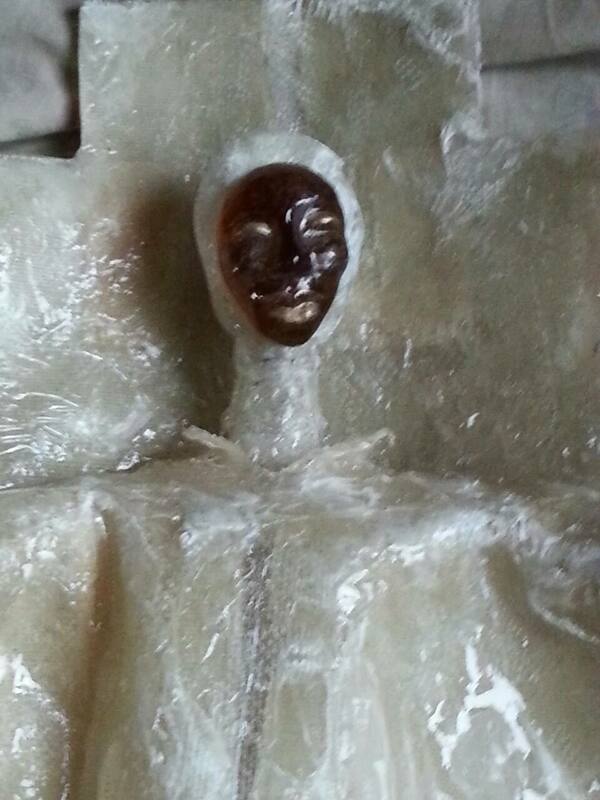 Justine got her final sanding, and I glued her face onto the form. It came out really well; the face is better than expected, I just have the hands to do. Those hands! What a challenge those have been! I’ve cast them twice now; there will be a third time! This time, I’m going to drop the temp and keep the hold time the same. Maybe this will be the winning combo! 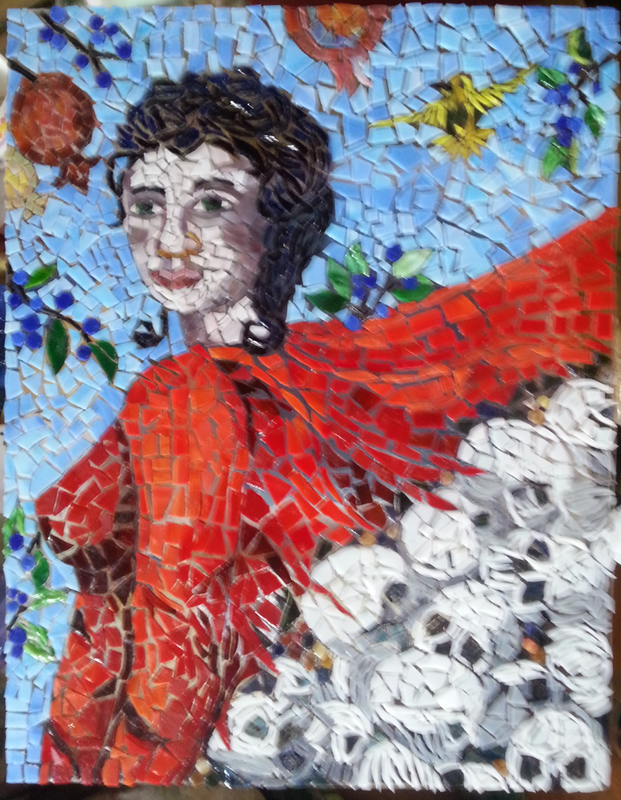 I’m working on another mosaic, for the 2015 Gearcon, themed Secrets and Lies. I think that’s a great title for the mosaic, especially considering the things I’ve learned about my family, these last few weeks. What you can’t see, at this time, are the skulls that are in the lower right hand corner. Those are about the bodies buried beneath not just my family history, but the blood, bone and flesh that most civilizations are founded upon. I used a white woman, because of my family history. The Chesse family is deep in the history of Louisiana and New Orleans, in particular. The French were deep into the slave trade, far more than the American south. The French enslaved approximately 1.5 million souls. My family has both the slave, and the slaver, in our veins. My branch was officially “Black” until my great grandparents figured out how to game the system, so to speak. When they got pregnant with my grandmother, they moved out of NoLa, and to Providence, Rhode Island, until after the birth. Since my Nanan was passe blanc, and her husband was all white, they were able to pull it off, thereby ensuring that their daughter was not bound by the Jim Crow laws. I get it, I totally do, but I sure wish I were able to have known some of the family that was left in Louisiana. Now, about another one of those famous relatives…. Peter Albin, of Big Brother and the Holding Company, is one of those talented people in my family tree. Just a couple of days ago, he and his band lost a friend and fellow member. I feel bad for them; it hurts like Hell to lose a life partner, whether that partner was a friend, a colleague or a lover, it’s never easy. As a kid, I had all of their work on vinyl. ALL of it. In fact, my neighbors hated “Summertime”. Really, really hated it, because I played ruts in that disc! I’ve had this album on vinyl, 8 track, cassette, CD and now, I have it digitally as well as on my Spotify playlists. When that guitar plays, those notes always gave me goosebumps! It’s in my will, that that’s the song they send my ashes off to the next adventure with. Who knows what’s after this life; I’m in no hurry to find out, but I will say, I am in, and always have been, in love with that song. It just says freedom, but a bittersweet freedom to me. This post today will talk about more of the process for Justine, and some more about those relatives! First I’m going to start with cousin Ralph Chesse. He was not just a Creole, but an artist of great talent. He is also another direct descendent of Justine, the mother of a large part of this family tree. He was her great grandson ( I may have that screwed up but I don’t think so). Here is a link to a site that deals in his work, I’ve met one of his art dealers and he was a very nice man, committed to his work and his artists. Disclaimer, I’m not 100% sure that the link and the man I met, are the same. There is a whole lot of important information that has been expertly compressed into one regular sized web page. Ralph Chesse was a pleasant surprise. He is deceased, he died in 1990, but his work speaks to the man, in many ways. 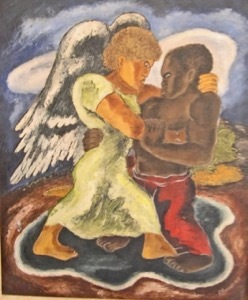 He was also a WPA artist, with a mural at the Coit Tower in Sand Francisco. I was so surprised to find out that my family was instrumental in the founding of New Orleans, as well as fighting in the Battle of New Orleans against the British. It was the last attempt of the British to retake the colonies; many free men of color fought in that battle, a point they made sure that President Lincoln knew when they sent that petition for civil rights to him. My Nanan, my great grand’mere, is listed as “Black” on her birth records in the city of New Orleans. Let me tell you! There has been some serious denial regarding this particular bit o’ history! I get my information from government records, whilst some of my relatives are totally not good with this. I will say, I do have a gift for researching records and topics; knowing how to cross reference is a talent, much like art. I get it, I do. At my age, I understand why my granddad did not tell me the whole story. He told me I wasn’t all white and had some black (his words) in me, but he sure left a lot out. He was part Native and that had been a problem for him; he also saw the crap one of my schoolmates and a neighbor had to deal with, as a mixed race. She was called some pretty bad names and treated pretty badly. She was a lot nicer than me; my fists were fast and unpredictable. I do understand why granddad was cagey about it. I also get that to be able to pass was to be able to sit at the lunch counter; it was access to privileges and to status that is automatically afforded to those of us of the very light persuasion, whether we realize that or not. So I understand the upset. I won’t pander to it, though. I have been looking at the records, at pictures from very long ago, and we Creoles have, to me, some distinctive features; our face shape, our cheekbones, with skin running the gamut from my fish belly white to rather dark. It has been a rabbit hole for me. A good one, but still a rabbit hole. 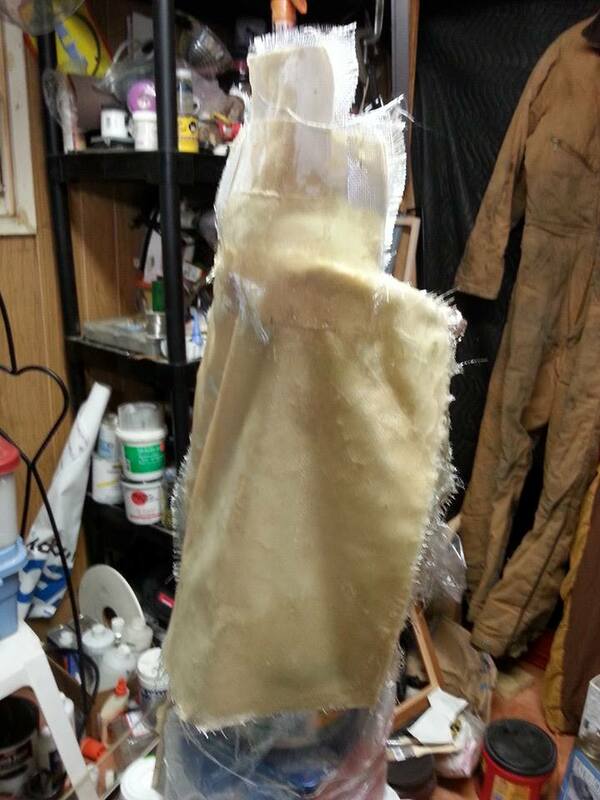 ; This is the fiberglass over the resin soaked canvas, like making a canvas canoe. 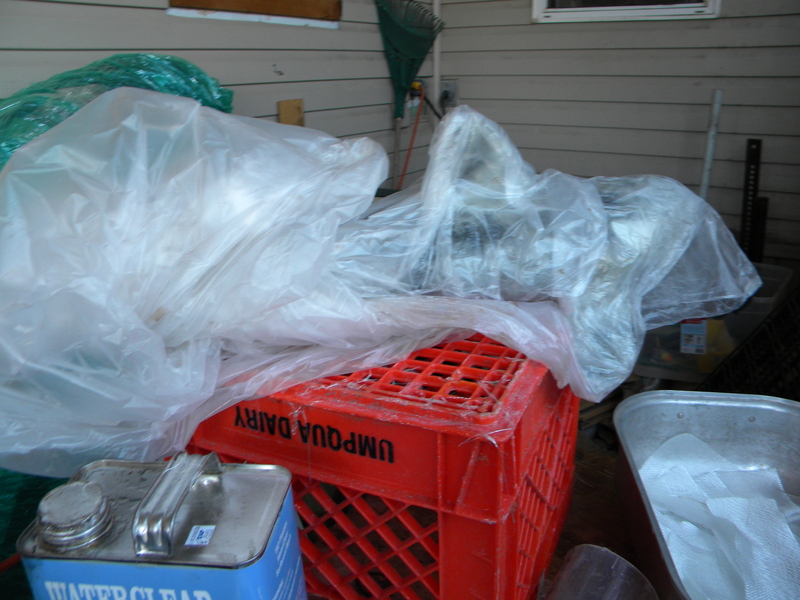 The plastic wrap, in the third picture, causes the fiberglass to cure quickly. At this point, I’ve just done the dress; her neck, head and hands come later. More on that next post. It’s been awhile, but MAN! has it been interesting!! I started grad school, for psychology, last September. Part of that was a family of origin project. My knowledge of my family has always been kinda sketchy. I knew I had some African American, but I had no idea how much, and exactly how it got there. So I signs myself up for an account on Ancestry.com, to fill in the blanks; this project had to go back at least three generations, I went back four. WOW! I was floored at what I found! First, that I have a lot of African in my heritage and I am actually a Creole. My third great grandmother came into the USA as a slave, from Cuba. I found out that I come from a long line of people “of color” as the records from Louisiana say. I found out that I have some pretty talented relatives; Peter Albin from Janis Joplin and Big Brother and the Holding Company. Matt Chesse, a very talented film editor; Ralph Chesse, a painter, and his son, Bruce, a powerful creative force in his own right, with puppetry. I also have made contact with Bruce, who I have come to love, very much. All of it was worth it just to meet him! We have a connection; we both love art, puppets and life. I haven’t met the other relatives, but I would like to sometime. I also have found out that my family has been intimately involved in the fight for civil rights, from a petition signed by many of them, that was sent to President Lincoln, in order to get the vote for African Americans and Creole peoples. I had relatives marching with Dr. King. I’m pretty proud of them. I’ve been working on a new piece about my third great grandmother, Justine Olivier. 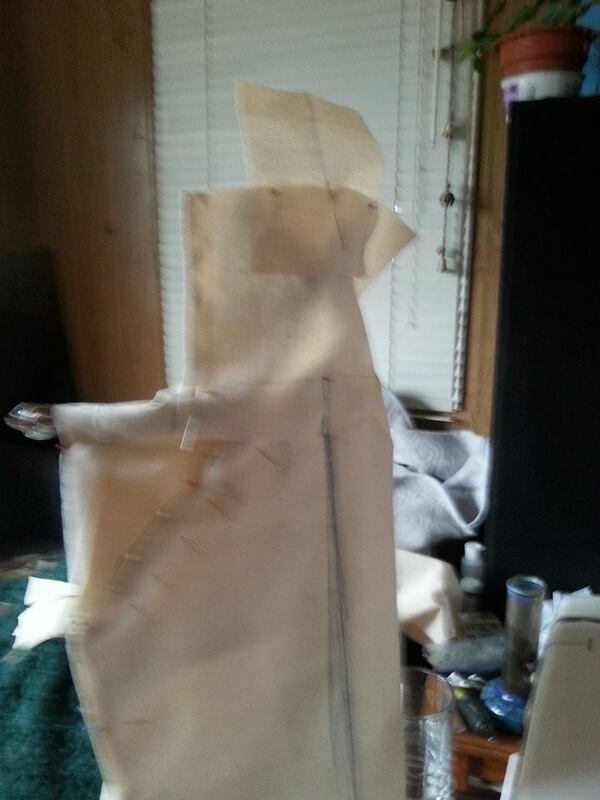 I’m doing a mosaic, a dress that is shaped to reflect the three sails of the ship that most likely brought her to New Orleans. It was very powerful to see her name on a slave manifest. I’m very light; almost fish belly white, sadly. This part of my heritage was really a taboo subject in my family. 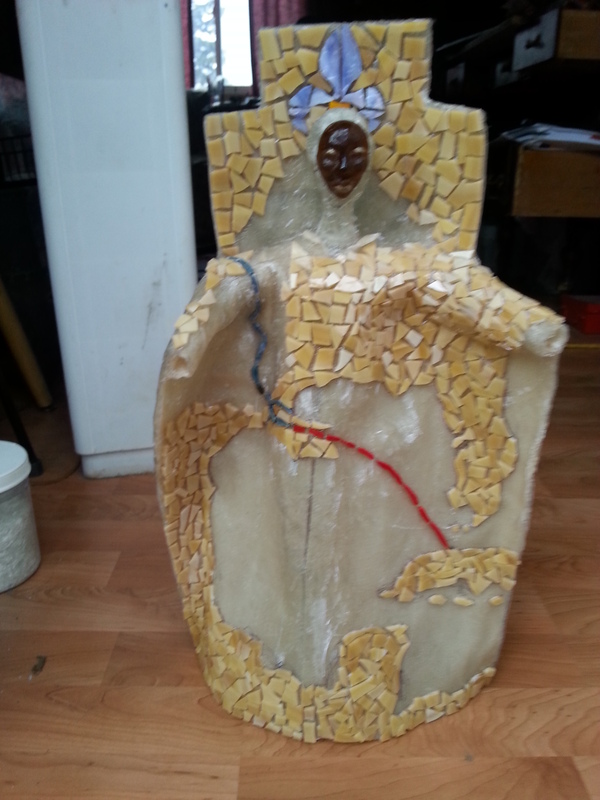 This piece is 3D, and will be lit from within, with the light concentrated in the center, and directed towards her face. Her face will light the topsails. 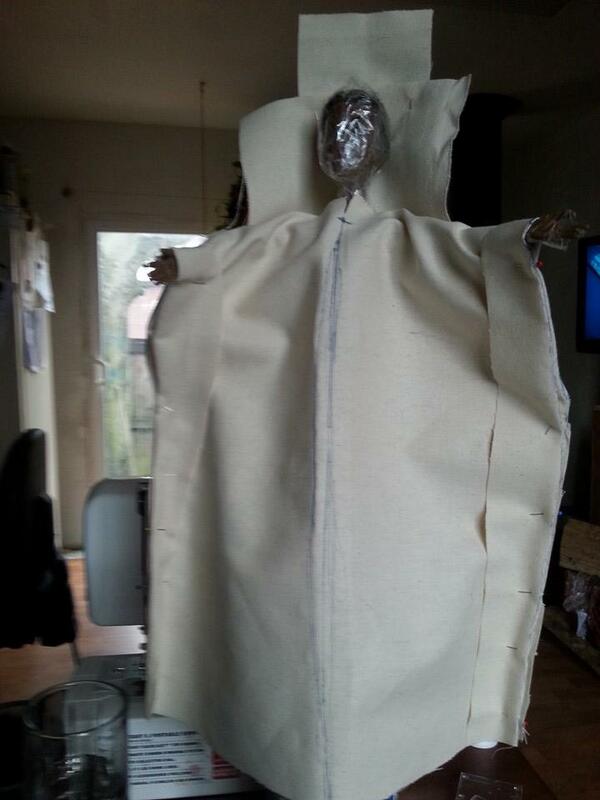 These images are of the draping process. 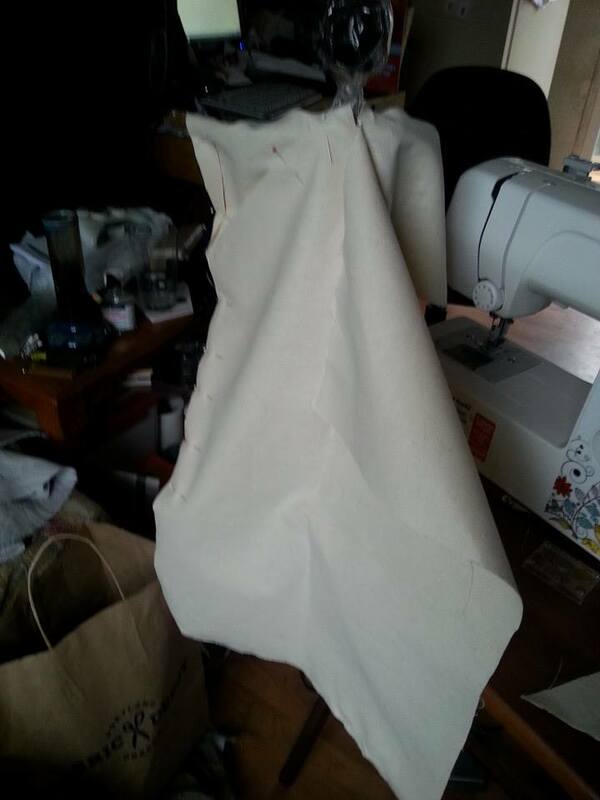 I used canvas in order to get the folds and the drape that I wanted. I used canvas because it was easier to work with initially than glass cloth. 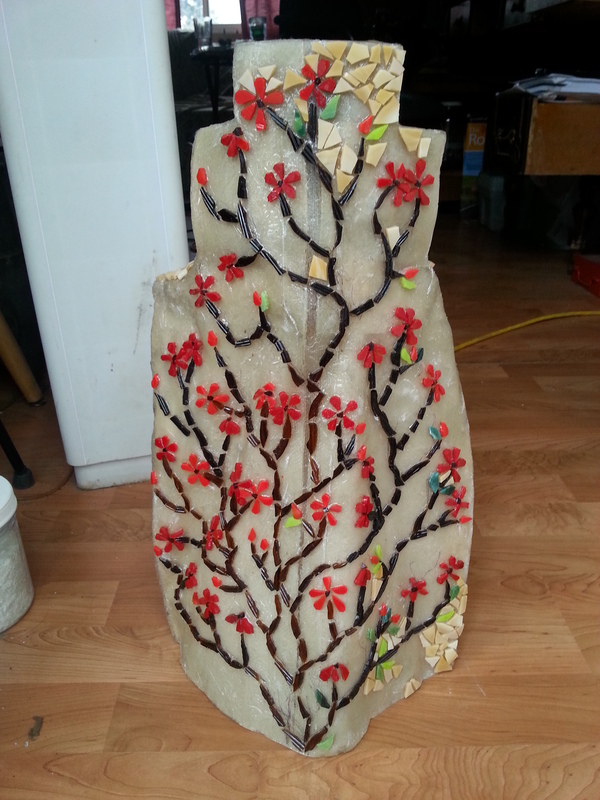 After the canvas was draped, I then coated the canvas in fiberglass resin. That gave me a workable surface that takes a bit of time to harden, even with curing agent. That is the point, though, because it gives me a chance to soak the canvas, then to work it into what I want. 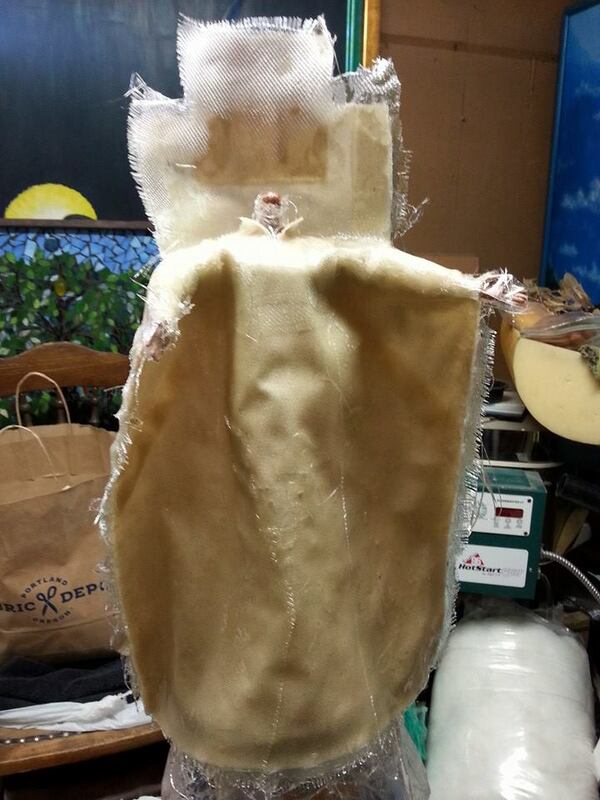 Next is the glass cloth and the fiberglass resin. Back to working on an orca. 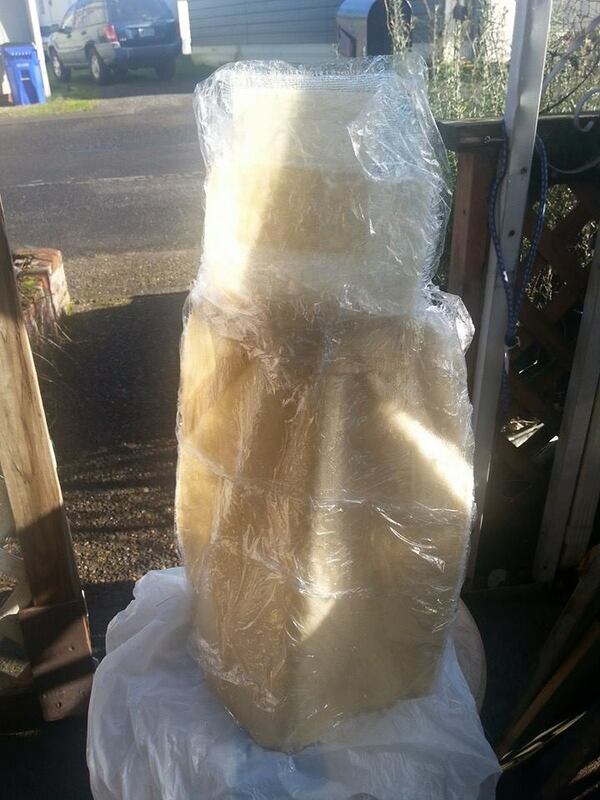 It’s not the big orca, that one is going to require a scaffolding to fiberglass the form. Nope. This is a little orca, one of five, for a piece with a pod, that will hang from a ceiling. I’m also going to use this little form, about 24″, to make an art piece that incorporates water, somehow. There is an idea, amorphous at this point, kinda roaming around in my brain. I’ll let it swim for awhile and then try to corral it. Here’s an image of the first orca. It’s wrapped in plastic because that cuts it off from oxygen, which makes the fiberglass cure faster and if one has too little catalyst in the resin, it also helps it harden. It’s a good idea to have a sheet of plastic around. 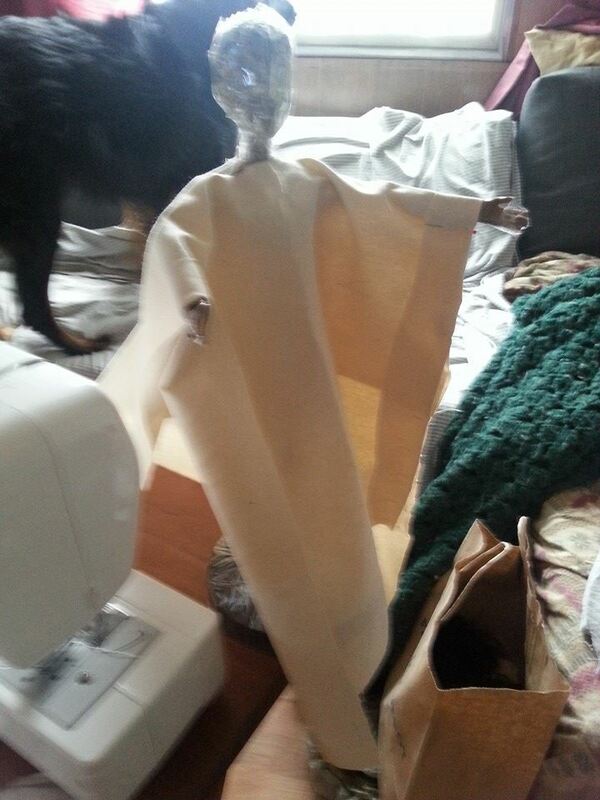 Nice thing, is one can reuse that sheet over and over again. The resin doesn’t stick to it after it hardens. I usually take a scraper to the forms after they dry, because the resin will harden in the shape of the creases of the plastic it’s wrapped in. A clay scraper, the one with the wooden handle and the double edged scraping blade, is the best. I also use a hooked knife for linoleum, as a scraper and to cut away rough edges. It does a great job!